In the early 1950s, the opening years of the Cold War, the western powers were highly concerned with the amount of powerful armor available to the USSR. In answer to this, the British military developed a ferocious new anti-tank gun, the 183 mm (7.2 in) L4. The race was on to find a suitable mount for this monstrous weapon. It was first proposed to be used as part of the FV215 project. 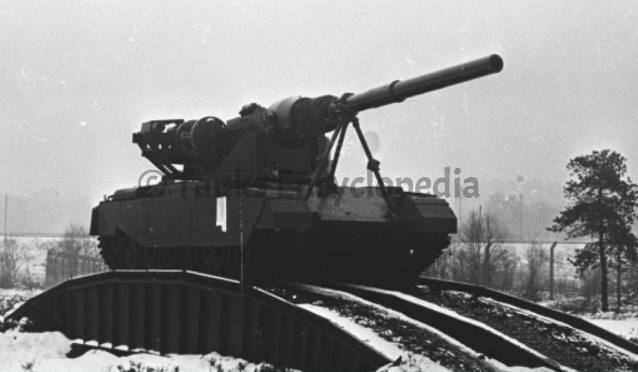 This self-propelled gun (SPG) design was based on the FV200 Universal tank concept. This vehicle, however, did not go further than the mock-up stage. 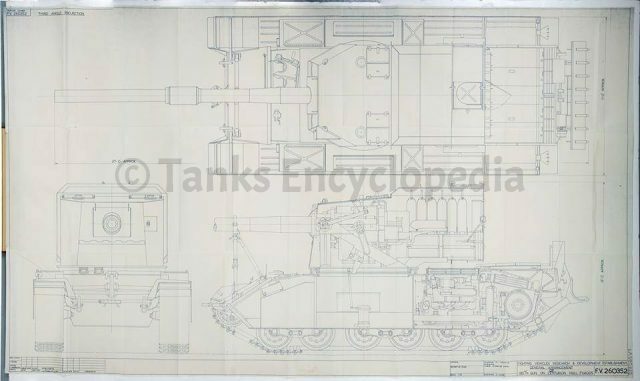 Designers tried again, this time with a proposal to mount the gun on the chassis of Britain’s trusty new Main Battle Tank, the Centurion. 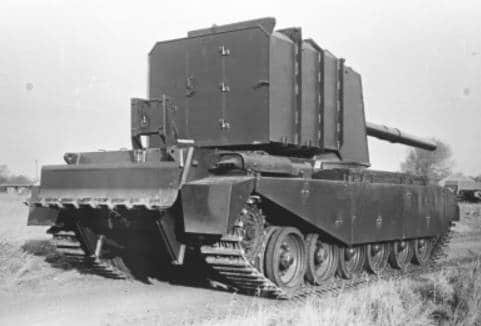 This vehicle would go under the project title of FV4005. 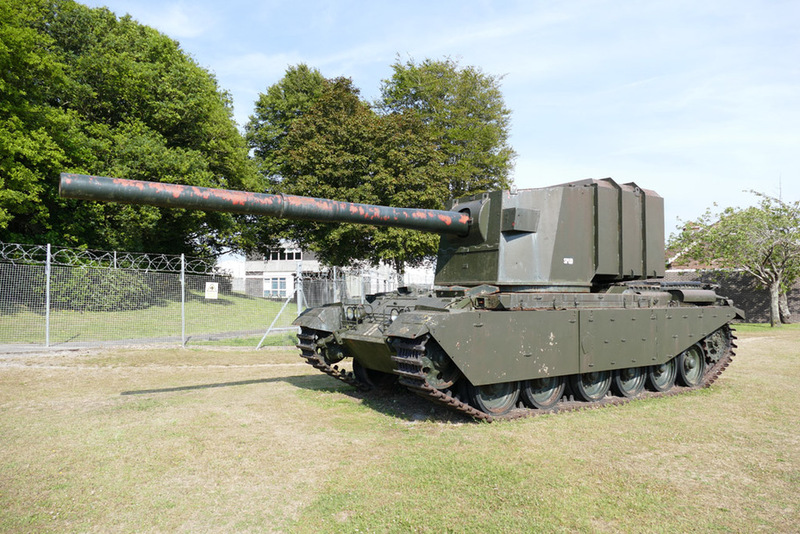 The FV4005 was a separate project from the Centurion based vehicle, the FV4004 Conway, armed with the 120 mm (4.72 in) L1 gun. The two projects were not related but had the same goals. 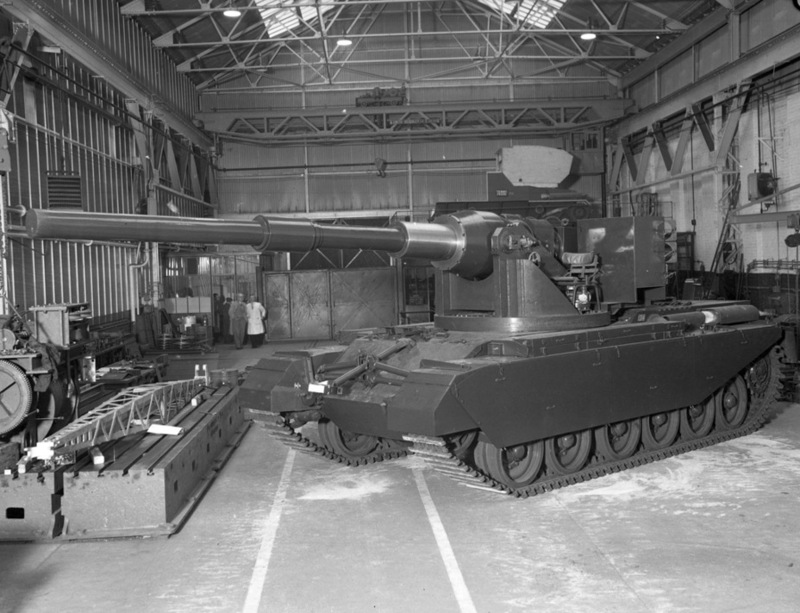 The FV4005 was fitted with a much larger gun. Vickers-Armstrong was in charge of the development of the tank. The Centurion chassis chosen for the project was that of the Mk.III. The platform for the gun was made to fit perfectly into the existing turret ring of the hull. Only slight alterations were made to the chassis. A large recoil spade was added to the rear of the vehicle and an equally large travel lock, or “Gun-Crutch” as the British called it, was added to the front. The recoil spade helped to keep the vehicle in place while firing, meaning the gunner didn’t have to re-adjust after every shot. The travel lock was used to keep the gun from swaying while the vehicle was moving, helping to reduce stress on its components. In 1950, work started on the Ordnance Quick Firing 183 mm (7.2 in) L4 gun. At the time, it was the largest and most powerful tank gun in the world. The cannon was based on the 183 mm (7.2 in) BL 7.2 inch howitzer, a WWI era weapon. The gun itself weighed a mighty 4 tons and when fired it produced the equivalent of 87 tons of recoil force. The L4 was designed to be chambered for only one type of ammunition, HESH (High Explosive Squashed Head). It was separately loading ammunition. The projectile was loaded first followed by the correct propulsion cartridge. Each shell weighed a combined total of 104.8 kg (231 lbs). A shell of this size understandably produced a substantial amount of fumes and smoke inside of the fighting compartment. As such, a large fume extractor was added to the barrel, a relatively new feature at the time. The 183 mm was tested in live fire trials against a Centurion and a Conqueror. In 2 shots, the 183 blew the turret clean off the Centurion and split the mantlet of the Conqueror in half. In total, the gun fired 150 shells. The FV4005 Stage I was a relatively simplistic vehicle, serving as little more than a test-bed for the 183 mm L4 gun. The hull of a Mk.III Centurion tank was chosen for the project. The gun was mounted on a platform in the turret ring, completely open to the elements devoid of any armor. The L4 was expected to have a rate of fire of 6 rounds per minute. As mentioned above, the separately loading 183mm HESH ammunition equipped to the FV4005 weighed a combined total of 104.8 kg (231 lbs) each. As such, the gun would require 2 loaders to service the weapon effectively. 6 rounds a minute would still be a hopeless fantasy, however. Testing highlighted stability issues with the platform when the gun was fired. It was also surmised that the open, unarmored fighting compartment, necessitated by the loading-system, was not worth the price in crew safety. As such, work began on re-working the gun platform. *It should be noted that exact details of whether the Stage I used an auto-loader is a gray area. As such, portions of information are missing from this segment concerning the vehicles weapon. In the not too distant future, we hope to shed light on these areas. Key Publishing Ltd., The Big Gun Centurions, Classic Military Vehicles. Written by David Fletcher. The FV4005 Stage II was the final form of the project. It was designed and built in 1955. The open gun platform was replaced with a large, box-like turret. The loading assistance device was also deleted, in favor of more traditional loading. 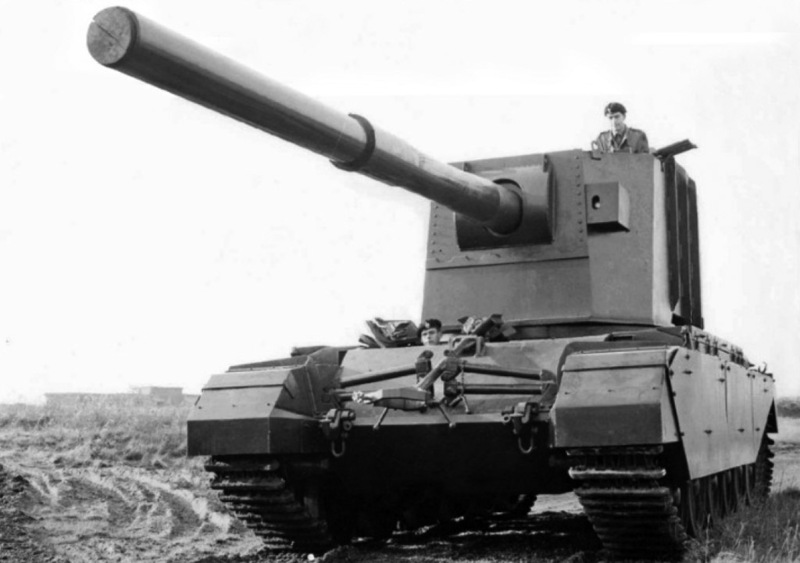 With the addition of the large, approximately 2-meter high turret, the FV4005 weight climbed to 50 tons. Despite being an extremely prominent target, the turret armor was only 14 mm (0.55 in) at its thickest. This was easily penetrable even by large caliber machine guns rounds. It also only had enough space to store 12 rounds. These rounds were stored in racks of 6 on each side of the large bustle. The turret housed 4 crew members. These were the commander on the forward left, gunner on the front right and 2 loaders positioned behind the gun. On the left of the gun, in a small box on the cheek, was a coaxial .30 cal (7.62 mm) machine gun. This was most likely used for ranging rather offensive/defensive fire. There was a large door in the rear of the turret bustle for crew access and ammunition re-supply. The driver was located in the standard position in the hull. It should be noted that the lack of armor was intentional. This vehicle was designed to engage at long-range, shoot and re-position. Flexibility was slightly hampered by the turret, however. In theory, it was fully traversable. On uneven ground, this was not recommended due to balancing issues with the gun. As such, the vehicle only really had a 90 degrees arc of fire to the left and right. January 1957 marked the end of the road for the 183 mm armed SPGs, despite admirable performance during trials. The intended role of the vehicles had been overtaken by increasing development of ATGMs (Anti-Tank Guided Missiles). These granted the same, if not better, anti-armor capabilities, with the experiments ultimately culminating in the Malkara and Orange William missile systems. Work would continue on the gun. Had it have been adopted, the L4 would’ve been succeeded by the 180mm “Lily White”. This only got as far as conceptual stages, however. The FV4005 Stage II is the only one of these 183mm armed vehicles to survive to this day. 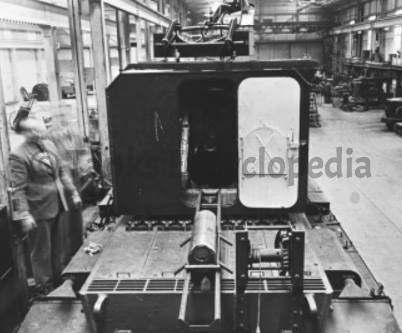 The turret is original, but it was mounted on a spare Mk.VIII Centurion hull, not the original it was trialed with. It is missing the recoil spade and travel lock. This “Cut-and-Shunt” representation of the vehicle now sits as a “gate-guardian” at The Tank Museum, Bovington, alongside an M4 Sherman. Its predecessor, the FV4004 Conway is safe and sound in the VCC (Vehicle Conservation Center) at the site. .30 Cal. (7.62 mm) machine gun. Armor 120 mm frontal hull armor. Turret 14mm all over. If a picture of the Stage 1 were to be made, I would bookmark this page on all my browsers. Though I can see how hard it may be to make one, seeing how the stage 1 only has its gun and autoloader, without a encased turret. Come to think of it, that sort of autoloading gun setup could work as the main weapon for some sort of superheavy tank, if it could work..
Why does it have the QF(Quick Fire)? I mean i understand the QF 6 pounder and QF 17 pounder in ww2 but how can this colossal 183mm gun fire fast? In the case of the 183mm gun it retained the QF designation because it used a brass cartridge case for the propellant charge as opposed to a bagged charge usually found on large calibre guns. When breech loading artillery was first invented in the 19th century most used a system of interrupted threads or other mechanical lock to seal the breech and provide a pressure seal (Obturation) to channel the propellant gases from the round forwards and thus push the projectile out of the gun. Such locking mechanisms were slow to operate as the breech had to be unlocked manually after every shot and swabbed to clear embers from the chamber. In British Ordnance terminology QF refers to guns that use a brass cartridge casing to hold the propellant charge (as opposed to a bagged charge) and also provide a seal for the chamber, this was applied no matter the calibre. these guns can fire ‘faster’ because the brass cartridge provides a seal, allowing for a simpler and faster mechanism, and removes any embers when it leaves the gun. Also another quick question where is the one surviving fv4005 at? It said that they put the turret on a centurion chassis, at least that’s what i read out of it. If it is somewhere i would imagine it would be within the country of origin Great Britain. Yes, the FV4005 turret currently sits on a non-original Centurion hull outside the gates of the The Tank Museum, Bovington, UK. This is probably due to it being heavy, and the traverse would be too restricted due to the weapon’s size. Plus aiming while turning the whole tank is hard, hence why fixed superstructures always have a bit of space for a few degrees of traversing. So when you turn the tank, you still have space for minor adjustments that could cost your hit and probably your life. I just want to ask what the British engineers were taking when they were designing this thing.